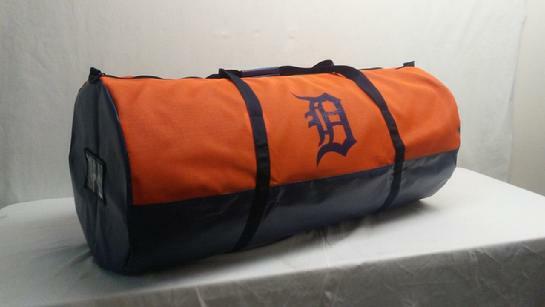 THIS LARGE SQUARE END DUFFLE BAG IS NICE AND ROOMY INSIDE. MADE WITH A STURDY 600 DENIER MATERIAL. ID WINDOW. U-SHAPE LID FOR EASY ACCESS.DETACHABLE SHOULDER STRAP. MEASURES 14x14x26. ALSO AVAILABLE WITH 3" ZIPPERED POCKETS ON THE ENDS. THIS IS A SMALL DUFFLE UTILITY BAG. IT HAS AN OPTIONAL LINED "WET" POCKET WITH A SEPARATE ZIPPERED OPENING ON ONE END. MEASURES 12x21. THE EQ/HELMET BAG IS A ROUND DUFFLE MADE WITH NYLON, MESH OR VINYL, OR ANY COMBINATION OF YOUR CHOICE. THIS IS A MUST HAVE FOR EVERY TRAVELER. IT IS OUR DELUXE SHAVING KIT. NICE SIZE POCKET FOR YOUR SHAMPOO'S, DEODORANTS AND RAZORS. MESH POCKET CAN HOLD YOUR TOOTHBRUSH, TOOTHPASTE ETC. SMALL ZIPPERED POCKET ON TOP. CONVENIENT S HOOK TO HANG ON DOOR. FOLDS FOR EASY CARRYING WITH VELCRO CLOSURE AND WEBBED HANDLE. HERE IS THE PERFECT CARRY-ON BAG! FITS RIGHT UNDER YOUR SEAT! NICE SIZE POCKET WITH U-SHAPED OPENING. FRONT & BACK ZIPPERED POCKETS WITH ADDITIONAL 3" POCKET ON EACH END. ID WINDOW ON TOP. SHOULDER STRAP FOR CONVENIENT CARRYING. TOTAL MEASUREMENTS WITH 3" POCKETS IS 10x10x21. THE PRO PLAYER BAG IS A POPULAR ITEM. NICE LARGE COMPARTMENT WITH A U-SHAPED ZIPPERED LID ON TOP FOR EASY ACCESS. ID WINDOW. LINED ZIPPERED POCKET ALONG THE FRONT OF THE BAG. ENDS ARE PADDED. ADDITIONAL 2" POCKET ON ONE END. TOTAL MEASUREMENT 14X14X32.